The Biggest Loser has unabashedly placed itself in the middle of one of the most problematic dialogues in America. Despite evidence that a fixation on dieting, calories, and pounds lost or gained can actually promote ill health (by either not effectively taking off excess weight or by promoting malnutrition through eating disorders), The Biggest Loser is fixated on a single goal: losing weight—as much as possible, and the faster the better. In a world where fat, an essential building block of the human body, has been demonized—and obesity labeled an “epidemic” as cholera was a century ago—this rather ridiculous notion has found surprisingly fertile ground in pop culture. The Biggest Loser is consistently one of NBC’s biggest hits, with massive viewership, product-placement deals, and advertising revenue. It has been syndicated to 90 countries and reproduced as regional variations like Biggest Loser Asia and Ar-Rabeh Al-Akabar—“the biggest winner,” which broadcasts in the Arab world. But The Biggest Loser is a painfully flawed show. It’s fantastic television, but it is bad life. The premise is that overweight people require some sort of push to help them lose weight, which they have concluded is the only thing between them and the life of their dreams. So they are sequestered on a ranch and forced through a grueling exercise regimen, which may not be medically healthy or even a proven weight-loss method, but sure looks good on TV. The contestants are then stripped down to their underwear, paraded around on a soundstage with a lot of flashing lights, and weighed. The ancient Egyptians’ gods weighed souls; Shylock traded a pound of gold for a pound of flesh. This is not dissimilar—a scale that offers a biased and narrow version of judgment that is worshipped with religious fervor. There is a lot of flawed logic underpinning the weight-loss paradigm. That overweight people are unhealthy, unhappy, and unattractive is certainly one of them. That anyone can and should look like Jillian Michaels or Dolvett Quince is another. That rigorous, painful exercise and restrictive dieting are the only paths to physical health is a third. There’s also the unspoken, widely acknowledged truth that if you are overweight, it is your fault. You are indulging in some weakness, goes the argument, or too lazy to get out of your condition. There are plenty of cases, undoubtedly, in which weight loss is a good or even great idea for some of the show’s contestants. In this season 15 premiere, a few admit to having health problems directly related to their weight—heart disease and diabetes, primarily. One woman confesses that her mother was addicted to drugs when she was born, and her body has coped by becoming addicted to food. These stories are milked for all they’re worth, invoking dead spouses, young children, and lost childhood dreams. There’s the former swimmer who turned down the chance to go pro and hates her current self, and the Olympic-level wrestler who thinks she didn’t make gold because of her extra pounds. I cannot deny that it is riveting. Each contestant has a story, and The Biggest Loser creates a narrative of personal empowerment with each contestant. If you don’t think about it too much, it’s possible to see this as a show where people who might not otherwise have a chance to succeed are cajoled onto a track that lets them achieve something otherwise impossible. The show wants you to latch onto its message of self-improvement, and tries to assure you that everything that’s occurring is medically safe and aboveboard. This New York Times article argues that it’s not, and there’s plenty of testimony from previous contestants about the culture of dehydration, deprivation, and overexertion in the world of The Biggest Loser. NBC presumably cut the show down to an hour to better gloss over some of the worst parts of the training—or maybe to de-emphasize the grueling physical strain—instead focusing on the narratives of the contestants. It’s not a bad idea. This season’s format also gives the trainers far more of a say in whether contestants have to leave the show, which means that how much they lose is not the only metric that determines their ability to compete for the $250,000 prize. But even with mitigating factors, there’s no way that a show built on such a broken premise can be salvaged. The programming is contrived and the emotional responses are manufactured, but the bodies the show is built on are real. 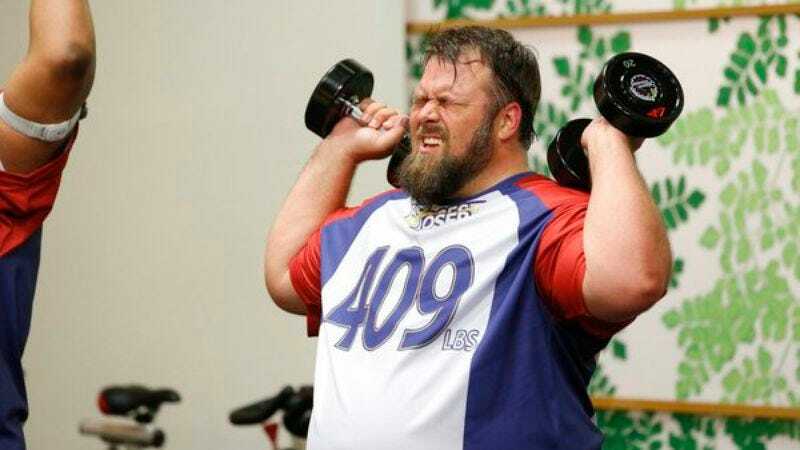 There is no special effects studio for The Biggest Loser; there are no stunt doubles, there are no fat suits. Each contestant stands on a scale in their underwear, exposing their deepest shame to millions of viewers, and for their effort they are handed a number, which is essentially meaningless with regard to actual health. It is not NBC’s fault that we live in a world where this score has become an indicator of self-worth and identity. It did not make the world this way, but it hopes that if you believe in the numbers, you’ll also believe that your life could change by losing enough weight—that if you lose 30 percent of your body fat, you’ll become healthier, happier, and more confident. There’s a horrible fascination with The Biggest Loser because it chimes with the deepest notions we have about our bodies in our culture. Even with good intentions, we are all susceptible to the subconscious messages of pop culture—whether that’s models on billboards or men in muscle magazines, skinny protagonists and overweight “sidekicks.” The Biggest Loser is insidious and painful, because it builds on our own insecurities with such obvious skill. I guess it’s hard to argue with a show that draws so many viewers and does so well. But I’m pretty sure it ends up doing more harm than good.